Logging today is a huge business. We have encountered more log-filled trucks than we could count. They barrel down the roads 24/7 dropping their loads and heading back into the hills for more. Logs are floated down the waterways, they are processed in innumerable mills and the processed lumber is loaded on the railcars that parallel the roads we travel. Behind them they leave gaping, treeless holes in the landscape. Brown scars stain the sides of the mountains. Grey stumps and piles of unwanted dead branches and limbs are all that remain of the forests that have been harvested. I understand sustainable forestry. As long as we build houses, buy furniture or use paper products we need a continuous supply of lumber. At least now they replant what has been cut down, as these resources are better “managed.” Signage along the road keeps you informed of how well this is done. “First cut 1934, Second harvest 1984, Replanted 1986, Next scheduled harvest 2036.” I guess that means the life cycle of a forest is about 50 years. What this process gives you though is a sterile landscape of similar trees is different stages of growth. Some sections 40 years old, some 15 or 10, some just newly planted. You can tell the age by the color or the trees. The younger they are the lighter the color green, but they all look the same. Which brings me back to Joni Mitchell. 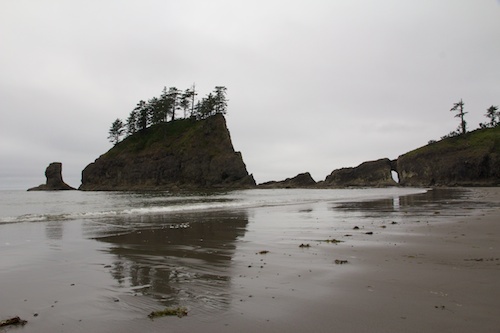 Olympic National Park also extends to the coastline. This is one of the reasons we planned this trip. Having grown up in the east, we wanted to see the pacific coast and at first glance we have not been disappointed. Yes, it was overcast and cool, but what a treat to be back along the ocean shore. The salt air, the squawking gulls, the rhythmic sound of the surf. 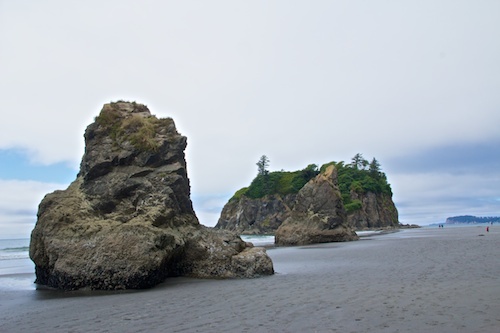 The pacific coast has the added bonus of the rock formations and haystacks and piles of driftwood and logs that you don’t see on the east coast. We can’t wait to see more. Cool and cloudy/foggy seems to be the daily forecast on the Washington coast. Looking forward to seeing the rest of it. A great post. Love the photos and the song spinning in my head. 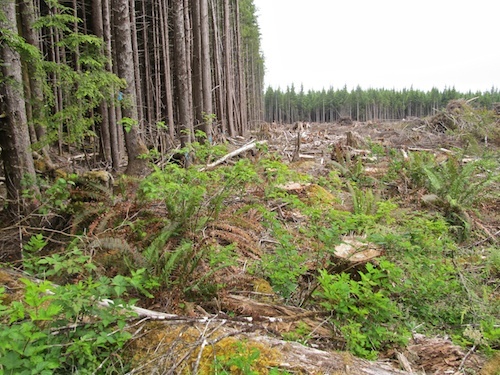 Seeing that clear cutting is really hard to take. I’m sure it is much faster than actual selection harvests. I guess we should be thankful they are at least replanting now. 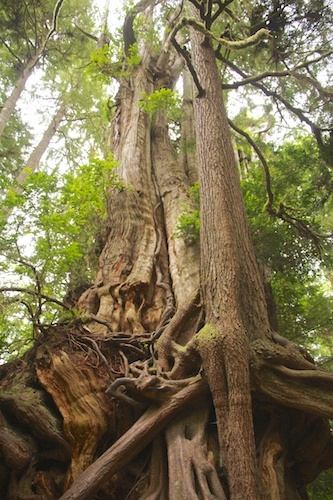 But what a sad sight:( I do love the photo of the ancient cedar roots!! Ahhh, the Pacific Coast from northern CA up is so very different than the Atlantic Coast. I remember the first visit and being in awe of the cliffs, fog, and huge rocks. (We’re from the east coast, as well) Can’t wait to see more of your travels in that area. We’ve never been there. Selection harvests take time and time is $$. You are right, they used to no even bother replanting, so it is an improvement. We are still in Washington, but doing a little of Northern Oregon coast today. It’s very foggy here on ocean, hope it clears so we see something. We missed this one for we opted to go the San Juan Islands instead. 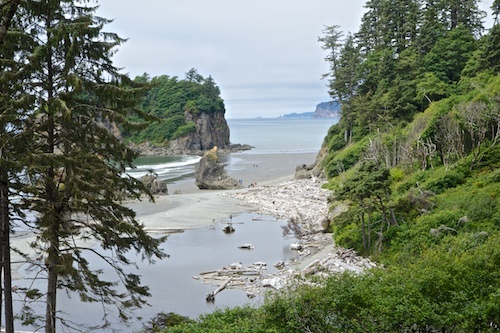 As we will be back in the West, the Olympic Peninsula is on the list. Thanks for the preview. Great photo especially the Ancient Cedar. Wonder if you would head to the Columbia Gorge, it is one of our favorite stop in that area. Its gorgeous out there as well. We are checking out your Nova Scotia/PEI posts, which month and how long did you stay there. We are heading there in a few days. Columbia Gorge is on the schedule. We are on southern washington coast today, Long Beach Peninsula, tomorrow we head inland for a week on a lake near Mt. Rainier, then we head down to the gorge. We were in PEI towards end of August, Cape Breton early August and Newfoundland in between Weather was great. Hope you are going to see Peggys Cove, it was a favorites spot. Enjoy it all. We are heading to NB tomorrow and thanks for your tip, Peggys Cove is on the list. Great post. Thanks for taking us to the great NW! Have you ever heard of reclaimed wood for floors and other woodworking. 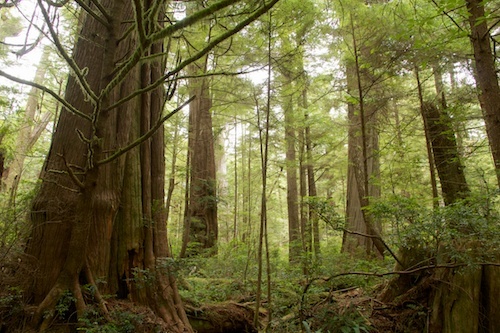 Its from old buildings and rivers, this wood is so beautiful and rich, and no cutting old forests!